32Red, part of the Kindred Group, are delighted to announce a 12-month extension to their current deal to sponsor Frank Warren’s blockbuster boxing shows, televised on BT Sport and BoxNation. 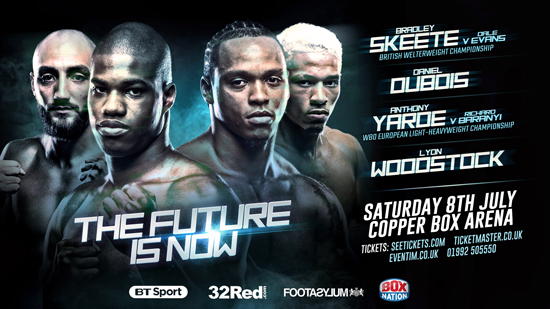 The new agreement, which begins with this Saturday’s ‘The Future is Now’ card from London’s Copper Box Arena, will cover all BT Sport and BoxNation televised events until July 2018. The Copper Box Arena card will showcase the depth of young British talent in the Frank Warren stable, with Bradley Skeete looking to win the British Welterweight strap outright with a victory against Dale Evans, and the red-hot Light-Heavyweight prospect Anthony Yarde challenging for the WBO European title. If that’s not enough, Super-Featherweight and Heavyweight sensations Lyon Woodstock and Daniel Dubois are hoping to extend unbeaten starts to their pro-careers. 32Red have been headline sponsor of the televised BT Sport & BoxNation events since the first show of ‘The New Era’ for British boxing in March of this year. In the relatively short period of time since then, fans have enjoyed an enthralling mix of world-level fights involving Terry Flanagan, Josh Warrington, Liam Smith and Liam Williams, as well as the emergence of future superstars of the pro-ranks in Zelfa Barrett, Lyon Woodstock, Anthony Yarde, Daniel Dubois and two-time Olympic Champion Nicola Adams. With Billy Joe Saunders and Hughie Fury fights scheduled for later this year, things appear to only be getting better for British fight fans. Gerry Murray, Director of Brand & Acquisition, 32Red PLC, commented: “We’re thrilled to have agreed a new long term deal with Frank Warren and his team. Since starting our relationship earlier this year, we’ve been fortunate to be involved with a number of excellent shows that have given our brand a superb platform to reach new potential customers. Promoter Frank Warren said: “We are delighted to have agreed a new long term deal with 32Red. I do believe boxing fans have been well catered for by the coverage on BT Sport and BoxNation of our promotions over the last few months. The fans at the venues certainly seem to be enjoying what they are seeing.